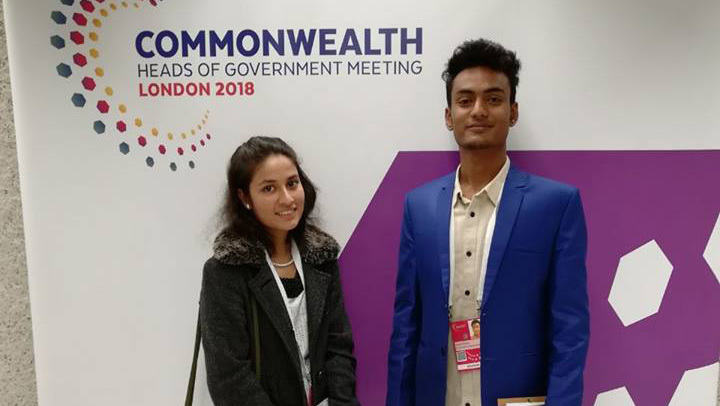 Tanzim Tabassum Tithi (L), from Bangladesh, is attending the Commonwealth Youth Forum in London this week. She’s calling for Commonwealth countries to take action on the growing challenge of modern slavery and violence against children. A World Vision Young Leader, she is a president of the Mymensingh Youth Forum, which is one of World Vision Bangladesh’s most important advocacy projects. Here, she blogs about the issues children are facing in Bangladesh and the change they’re making. The future of the Commonwealth depends on a billion young people. But in many countries, it is the adults in a family that dictate what happens in these children’s lives. These children can’t play when they want, they can’t go where they want, they can’t study their favourite subject. Some aren’t allowed to decide how to they want to live their own lives. This is harmful to their personal development and means they're unlikely to achieve their goals in life. Child marriage is a very common issue in Bangladesh where I come from. The child forum I work with - which is backed by World Vision - has helped stop approximately 22 child marriages from taking place and enabled these young girls to continue their studies. We have faced a lot of problems, and this work has not been easy for us. But we do have support - our respective local authorities and police officers help us each and every time when it comes to the important issue of preventing child marriage. We also are working against child labour - the child forum started an evening school called “Ghashful” - meaning grassflower - for those children who are forced to work. Before 2017, the local government provided no budget to assist these children. We demanded that this change and they promised us to fulfil our demand. We are also working with the parents of autistic children, because many in Bangladesh believe their children to be a "curse". The child forum organised a parents’ conference with the aim to help them understand what autism is and how they can assist children with it. We have a school for autistic children, and about 42 children are studying there. In our child forum, we also have a library with 600 books for children. Our motto is "a wise heart can never be poor", and we aim to make sure children have the opportunity to learn more than what is just in their text book. There is so much work we do, and so much more that can be done. I feel that the Commonwealth Youth Forum is an excellent opportunity for me to learn more about interesting topics by participating in discussions and action planning sessions. This will help us to become more politically active and have our work recognised outside our country. It's important to build cross-culture connections and networks, to mobilise young people to conduct youth-led initiatives and influence decision making, ensuring that their voice is heard in the future. It’s a space where young people from different countries, cultures and religions come together to reaffirm our common values and shared views. These will enrich our knowledge and skills, so we can work towards a fairer, more secure and more prosperous future.